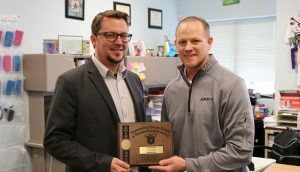 East Mountain High School instructor Trey Smith was recently honored by the National Federation of State High School Associations. Smith was given the Outstanding Speech, Debate and Theatre Education Award. 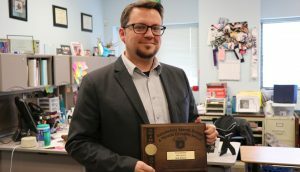 The NFHS gave Smith a plaque and certificate for grateful appreciation of outstanding service and unselfish devotion to the speech and debate program. Smith started the East Mountain Speech and Debate program from scratch in 2007. Each year he was able to double his team size to where he is now with a 60-person debate team. Last year he led his team to a third place International Debate ranking. Smith likes to ensure that speech and debate is an inclusive activity. “We have a nice crossover where some of our top athletes are actually some of our top debaters as well,” said Smith. Smith also orchestrated the bid to host the 2020 National Tournament in Albuquerque. It’s the world’s largest academic competition. Smith will also be honored as part of a feature-length article for a future issue of the on-line edition of the NFHS magazine High School Today.